Occasionally we receive email from someone who wants to remove or change the position of the Page Saver toolbar icon (for example, moving it to a different location on the navigation toolbar or moving it to another Firefox toolbar). It is not obvious to many people how to do this, so I thought I would write a short article that explains how to customize your Firefox toolbars. At this point, you can drag items out of the dialog to any location on a toolbar or you can drag items that are already on a toolbar to a different location or to another toolbar. 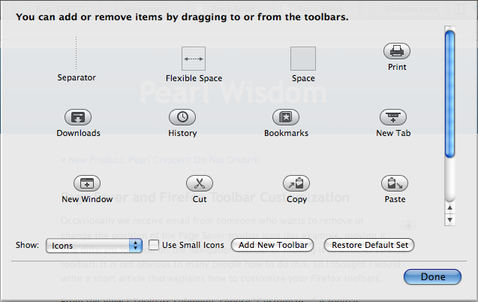 To remove an item from a toolbar, simply drag it into the dialog. When you are finished, click the Done button. That’s all there is to it! The only caveat is that some toolbars cannot be customized (but most can). Some of the customizations I like to make are to add separators and spacers and to remove the Firefox search box (I define keywords so I can search directly from the location bar). You can also read the official Mozilla documentation on toolbar customization. This entry was posted on Wednesday, August 6th, 2008 at 10:42 am by Kathleen Brade	and is filed under Cool Tools, Page Saver. You can follow any responses to this entry through the RSS 2.0 feed. Both comments and pings are currently closed.